By integrating visual collaboration solutions into their curriculum, learning institutions can deliver quality education to more students in less time. The result is reduced costs, improved productivity and increased student satisfaction. Education plays a very important role in one’s life as it imparts knowledge, values and awareness. Now-a-days it is must for the overall development of a person. With the advent of technology and globalization, we have been exposed to many more avenues and careers, which has invaded the conventional education system and opened the gate for international schools and methods. We need to be follow the international standards of education to make a bright future for students of the nation. The video conference software is the answer for impart quality education to each and everyone and to reach the international institutes without thinking of the expenses involved. There are many of us who want to give the best to our students, but due to lack of resources and facilities it becomes impossible. But not anymore, now you can have access to many of your students and many teachers like you with whom you can discuss, plan and execute in your real classroom. A lot of research can be done online for implementation of new methods of education. Virtual classrooms provide a robust learning experience similar to that of a traditional classroom. Students can join one and listen to the professor’s lecture while simultaneously viewing the presentation. They can easily engage and interact with the instructor and their peers, as well as participate in group discussions. Additionally, professors can set up separate virtual rooms designed for group work or breakout sessions. Mobile telepresence carts can connect students with video-enabled learning institutions, such as aquariums or zoos, for a unique, interactive learning experience. Additionally, distinguished professors and industry leaders around the world can present and interact with students without the need for costly and time-consuming travel. 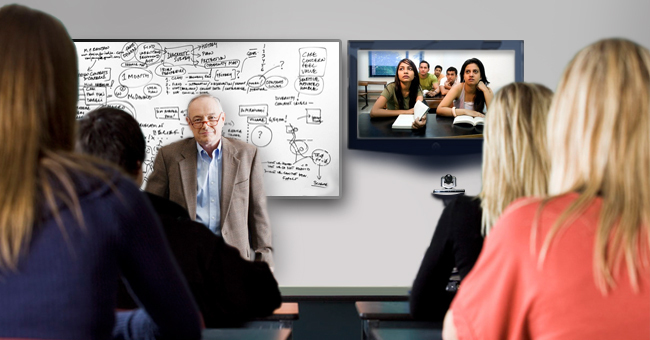 Visual collaboration solutions can be used to connect educators for professional development seminars or other discussions. Educators can meet to discuss best practices, trends, and other issues without the hassle of driving to a central location. Additionally, learning institutions can record and distribute these meetings through Video-on-Demand making the material available for those who were unable to attend the seminar.